As your organization competes in today’s marketplace, you need to be confident that you’re making the right business decisions, especially when it comes to technology. But, by staffing for a full IT department with an internal CIO can be expensive. Fortunately, there’s a simpler, more cost-efficient way. 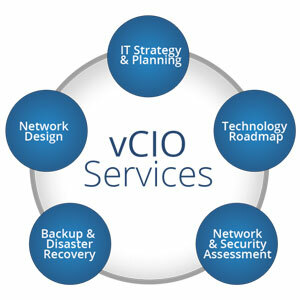 Streamline provides virtual CIO (vCIO) services that give you the strategic planning and guidance you need to make critical business decisions. We want to answer any questions you may have, provide you with additional information, and deliver effective solutions for your technology needs. The only way to meet the current and future technology needs of your organization is to have a comprehensive roadmap that reviews where your need is now and accurately forecasts what you will need in the future over a multi-year timeline. The wrong technology roadmap (or worse, not having one at all!) can have a negative effect on your sales and operational goals— the main heartbeat of your business.